As we predicted, Travis was only with us for about a week before he was adopted. Now he’ll be getting plenty of cuddles from his new parents, Barbara and Jeff, especially while he recuperates from neutering surgery and having a few teeth and skin tags removed. Lucky Travis now has a four-legged brother, Tucker, and a new name, Crosby. He and Tucker already like chasing each other around the sofa. Boys will be boys!! Our cute, cute Skylar went off to her home on Monday. Her new mom, Liz reports that the first night was great. Skylar sure won all our hearts and will be missed. We are so happy for her to have a wonderful forever home and a doting mom. 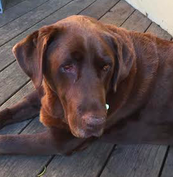 The first time we all met Buddy, a 9-year-old blind chocolate Lab, he'd joyfully roll over with his legs in the air and demand – quite rightly – a rigorous belly rub. He's just one of those delightful dogs that just embraces life with a robust tail wag and lots of kisses. 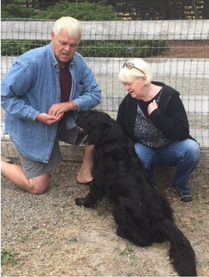 Paula and Russ, previous Lily’s adopters and Buddy's new humans, were destined to adopt Buddy. It was love at first sight (first pat for Buddy!) Within 30 seconds, it was crystal clear they were meant to be his new mom and dad. 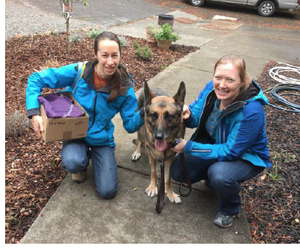 And so our beloved Buddy packed his bags and headed home to his new life with Paula, Russ and Lily’s alum, Cali. We’re going to miss our favorite love bug but we're all so happy for him! Here he is this morning enjoying his big yard with dad, Russ. Yeah! Look at that face. She came, she saw and she was gone! 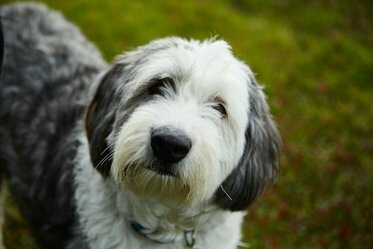 Heidi is a 7 year old Old English Sheepdog and as cute as can be. And she's a snuggler - she is ready for some serious couch time with her new family. Heidi was taken in by a neighbor last fall after many years of way too much time alone (yeah, we don't get it either). Sadly the neighbor, who had her own herd of small dogs, knew nothing about caring for big dogs. 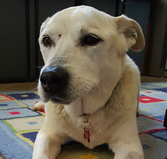 Heidi, while not alone as much, still did not receive the care and exercise she needed. So she found her way to Lily's - for about a day. She was happily welcomed into her new home with a family that is ready to make up for all the alone time Heidi spent before she found them. As the song goes, "Ya gotta have Faith!" And her new moms couldn't agree more! 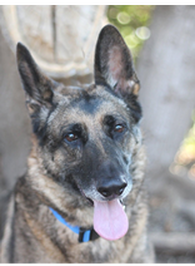 Faith is a shy 9 year-old German Shepherd who found her way into their hearts. 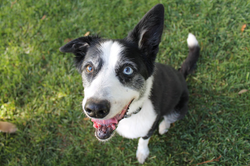 She loves to be outside and is a mellow walker with delightful bursts of playfulness. She's ready for a quiet home life and, like most of her breed, she bonds well with her persons. Her new family has no problem with that. April, 2017 update: Our beautiful Faith came for a visit last Friday with her moms, Erica and Jill. She looks wonderful and was very glad to see us. She has however, clearly bonded fiercely with Erica and Jill and very happy to get in the car and go home with them. It just warms the heart to know Faith has landed in such a loving home. 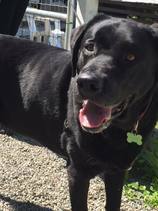 A 7 year old black Lab from the Oroville area who is smart, well mannered, good with other dogs and who loves, loves, loves people! 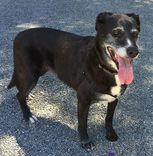 ​Rescued from a Yuba County Shelter, she went straight to her new home. If Kate actually spent any time at Lily's we would have had a hard time letting her go. 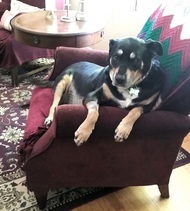 Kate is heartworm positive but that didn't stop her family from saying, "Kiss Me Kate" as soon as Lily's rescued her. Her new family met her at our veterinarian’s office, fell in love and that was that. Her new family is so HAPPY. Kate is so HAPPY. ​It's all about the happy with Kate. 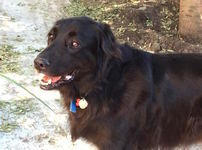 A 7 year-old black Lab/ Golden Retriever mix adopted by his fabulous new owner and now living in Grass Valley. From his mom: "He loves to run, fetch balls, then lies down w the ball and plays keep away with me! He is a snuggler, and thinks he's a lap dog! He falls asleep in my lap sprawled on the couch when I'm watching a movie.He has deep brown soulful eyes that seem to understand every word I say to him. He is a sweet dog companion!" Logan, a 10 year-old Shepherd mix, came in as an owner surrender. He didn't get a lot of attention or human contact but that all changed when he was adopted shortly after coming to our sanctuary. ​In addition to his wonderful new human mom and dad (and dad works from home-yeah! ), Logan also has a new doggie sister, Ellie, and a kitty. He gets along great with both and looks super happy! In addition to a lovely home in the Bay Area (complete with yard) there is also a weekend home in Tahoe. What fun for Logan and Ellie!! Here he is playing with his canine sister, Ellie, in the backyard of his home and playing in the snow while visiting his weekend home in Tahoe! Logan says, “I LOVE my new family and my new life!!!" 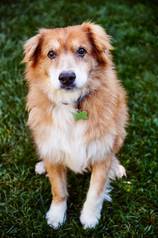 ​Rocky, an English shepherd mix, came to us from a Lake County, CA shelter. He's reported to be 15 but he doesn’t act it at all. He is likely a few years younger. Rocky’s wish came true on a recent Saturday. He left with his new family to his wonderful forever home. The very next day it was truly MUSIC TO OUR EARS to hear what his new family had to say about him! He sure looks comfy on his living room bed! Way to make yourself right at home Rocky! Hurrah, sweet Copper has been adopted! Copper has really scored… here he is with his new mom. She is home most the time so our cute boy will get loads of TLC !!! 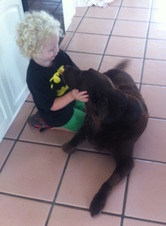 Here’s a heartwarming update from Copper’s new family…. 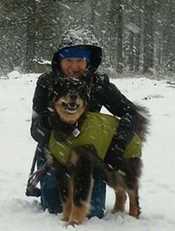 “Just a quick note to say Copper is doing great in his new, forever home with us! Not even one accident in the house, he sleeps all through the night, enjoys his two short walks each day, and between walks he stands by the back door to let us know he has to go out (he likes it when one of us walks in the back with him and that's fine with us). He also loves meal times...a lot!!! He easily takes his Rimadyl and had his Heartguard and flea meds as scheduled. We haven't left him alone at all, and he and I have been relaxing a lot...I can work on some Christmas crafts with Copper right next to me on one of the 3 beds we have for him. I'm pretty sure he is smiling most of the day! What else can I say but that he is the BEST, SWEETEST dog ever!!! 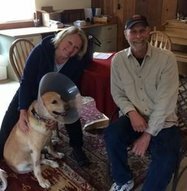 Jon, Amy and I are so thankful that Copper found us." Cute Rex went to his new home and his super excited Mom and Dad, Anya and Jeremy. First report is that he is settling in well and mutual adoration abounds in the house. Lucky boy! 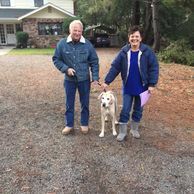 ​Mom and dad, Rosita and Jim are over the moon happy with their new addition and Bailey is too. He discovered a whole pail of tennis balls (his favorite!) when he first got home. Then while exploring the house, he found two more that Rosita didn’t even know were there. 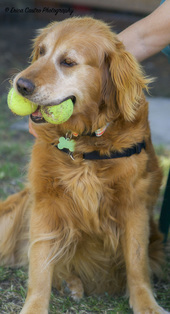 Bailey has scored big time, both with is new forever home and his apparent endless supply of tennis balls!! Buck & Sheri fell in love with Drake over the internet. As soon as Buck & Sheri saw Drake it was mutual love at first sight. "Drake is such a delight. He has stolen everyone’s hearts! WE ARE IN LOVE WITH DRAKE! We walk around randomly telling him how much we love him multiple times a day! He gets three walks a day, eating well and no tummy problems. He is a snuggler, happy on his leash and with his chew toys and he is happy to just be where we are. Thank you for letting us be his new family... Buck and I keep crying we are so happy. I know we sound like basket cases, but we are beyond happy. With all our friends and family, Drake will not want for love." Sounds like a match made in heaven, we’re so happy they found each other! Sweet Deli never gave up hope that her perfect family would eventually come find her. Well, now she knows it was definitely worth the wait, she’s hit the jackpot! Our Miss Deli got adopted at the Marin Pet Fair. It was another wonderful Lily’s miracle (that almost didn’t happen!)…. We almost didn’t bring her to the Fair on that glorious day. Almost. Deli’s new family came to the Pet Fair hoping to talk about possibly meeting her. Fate clearly made sure Deli was on hand that day. The moment they saw Deli that was it! After 30 seconds of spending time with her, Deli’s new mom said to her husband, “This is our dog!” By the time they filled out the application, they had bonded. Deli never looked back as she walked out with her new family. Of course the rest of us were basket cases, crying and clapping with joy. All of us at Lily’s are going to miss her, but we are “over the moon” happy for her! Here’s an update from her mom, Leslie…..
An owner surrender, Piper came to Lily's in mid-September of 2016. Shortly thereafter he went into a foster-to-adopt home. Sweet Piper didn't get much attention from his previous owner but he sure is getting lotsa love now. Lucky Piper! She wasn't with us long, this shining Star. It was love a first sight for her new family and she was joyfully whisked off to Vallejo. Lucky is a Shepherd/Lab mix was an owner surrender rescue (his owner had him since he was a pup). Lucky has lived up to his name. Back in May, he was pulled in the nick of time from a shelter in Turlock. From there he took the Lily’s fast-track to the vet and to his fabulous foster home. Lucky had yet another lucky day when he found a wonderful forever home. 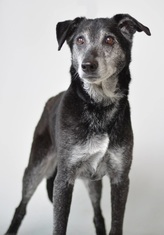 Sage is an adorable and super sweet 10 year old English Shepherd/Lab mix. She was only with us for about a week until she won the heart of her new mom. 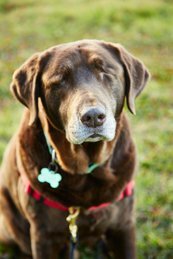 Prior to coming to us, poor Sage was bounced back and forth between houses after a divorce and was allowed to get extremely overweight. She needs to lose about 25 or 30 pounds and her new mom is helping her do just that. Mom shared this picture with us saying, “She got up there all by herself!” She sure looks happy!! Clearly she's getting lots of love and TLC while she loses the extra pounds. 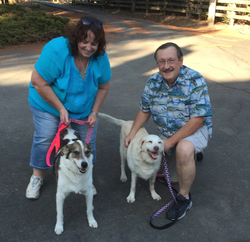 Cody, Dusty, Max & Sophie - All living happily ever after with their new families too. Sophie followed in Onyx’s paw-steps, she had her bags packed early last week. So Friday when her new mom, Melinda came she was all ready to hop in the car and head off to her wonderful new home in San Rafael. Just in is the weekend update from her mom, Melinda. All is going well and Sophie (now named Meadow) is settling in well. It's a love fest at her new home. Onyx hopped right in the backseat with mom and posed for one last picture before heading off to San Jose. 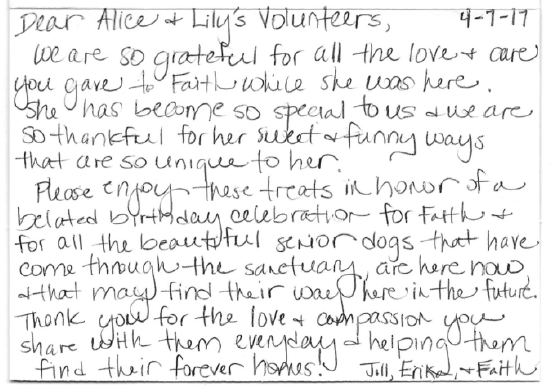 Thank you Pat and Sue for adopting another Lily’s pup! Onyx is one lucky girl. She is settling in very well and getting along great with Trooper – her new canine brother. Misty came and Misty went……This lucky girl has been adopted by a Lily’s Board member, Pris. Misty now has a new brother Leo, another Lily’s alumni. We’ll miss sweet Misty, so glad she’s found a forever home. Hurrah, Oliver has been adopted by a wonderful family from San Jose! 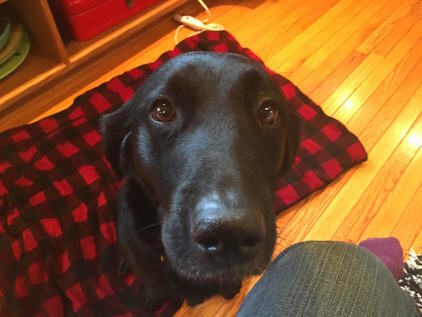 Lucky Oliver gets to go to work with his new dad and is apparently settling in well with his new mom and dad and 2-year-old human sister. 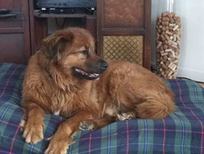 Thank you Nancy G. for fostering him many months and giving him so much love as he recovered from heartworm treatment. Didn’t take long for Boomer to no longer be a foster pup. Foster mom Ann has officially adopted him…there was no way she was ever going to let him go. 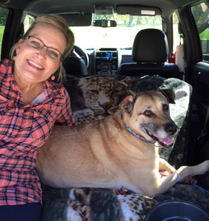 So happy for Ann and Boomer (and Kittens too), it is a match made in Heaven! 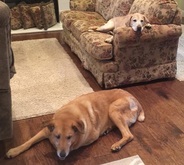 ​Gus (on left) is enjoying a wonderful, relaxed life with his sister Lacey (another Lily’s pup). 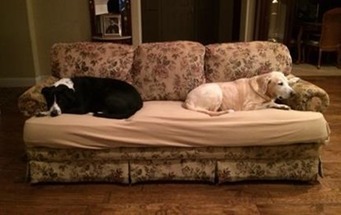 They have their own couch! Lacey and Gus are quite the happy pair don't you think? 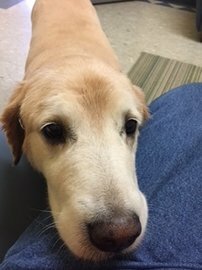 Just when Boomer went home with Ann, there was a need for a space for newly arrived Jasmine, a beautiful 8 year old Golden Retriever. Timing was everything, Jasmine transitioned into Boomer’s backyard suite. 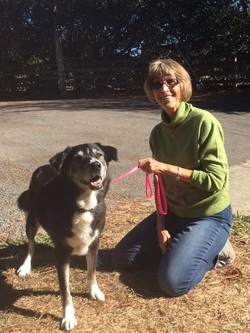 Then Donna T. kindly offered to foster Jasmine until she found a forever home. It didn’t take long before someone was interested in Jasmine. Donna brought her back to the Sanctuary on Saturday to meet Cheryl. Everything went great, it was a good match and Jasmine was adopted on the spot. She went home with Cheryl for a few days and then Donna will take her back while Cheryl is out of town. Paws crossed for another happy ending! Maria, a woman down on her luck, showed up at Lily's for an evaluation on her 2 senior dogs, Princess and Valentine. Unfortunately, we didn’t have room for either of them and Maria left to take her dogs to the dog park. 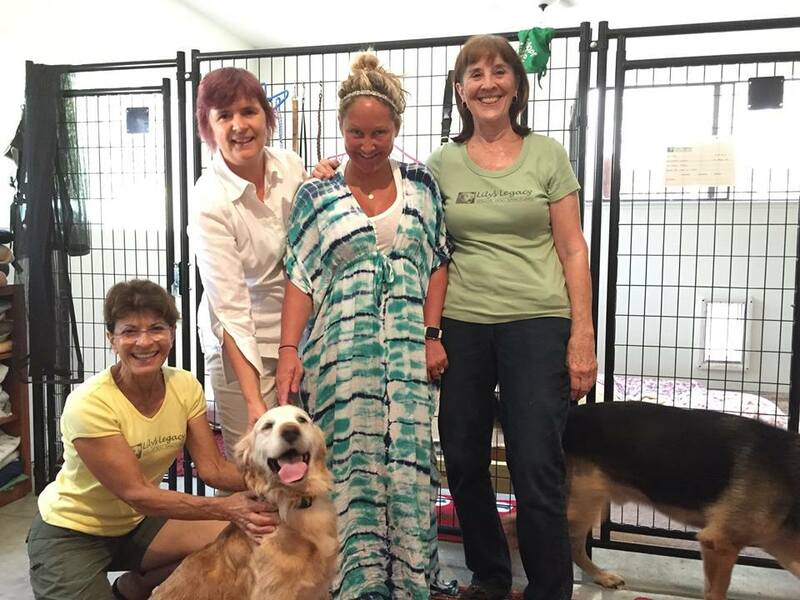 Shortly thereafter, 2 women came to meet Dusty. After getting to know him, they realized that he would not be a good fit with their other 2 dogs. 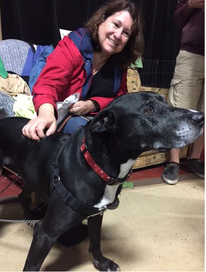 Here’s where the miracle starts to unfold.….Linda says, “You know the black lab (Princess) that was just here might be just what you’re looking for!”. Alice being ever "on the job" immediately jumped into her car, drove to the dog park and brought Maria & Princess back to Lily's. Amazingly, the two women fell in love with Princess, there was an instant connection! And by the way Princess jumped into their car, it was pretty obvious that the feeling was mutual! 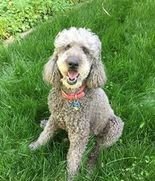 Remember Amy, the beautiful 11 year old silver standard Poodle? 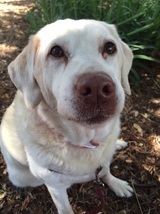 She had spent the last 9 years as a caregiver to her owner who had Alzheimer's. 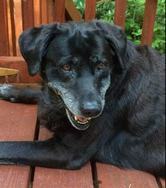 When her owner had to move into a long term care facility Amy was fostered by her owner's human caregiver. 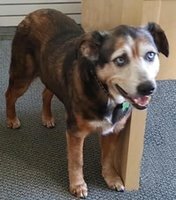 Good news, she has now been adopted by a wonderful couple who already have a beautiful 8 year old silver poodle as well as a standard Airedale. After meeting Amy, it was love at first sight! As expected, sweet Miss Pearl didn’t stay long in the Bunkhouse. She headed out to her wonderful new home in Los Altos last Monday. Her new mom and dad (Barbara and David) are retired, are home most the time and our cute Pearl will be well loved and cared for! 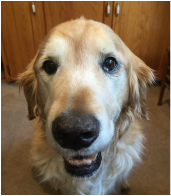 Our darling 13-year-old Golden Retriever, Juanita (now, Emily) chose the Express Route through Lily’s Legacy. She was an owner surrender who was in need of some immediate medical attention for a benign growth on her eyelid and one on her hip. While recovering from these surgeries, we received an inquiry about her from a couple who lived in Sparks, Nevada. Because one of the unofficial mottos at Lily's Legacy is "Nothing is Impossible!" and we know our Lily is at the helm from the Rainbow Bridge, we were not discouraged. 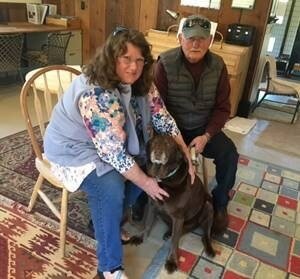 As it turned out, our Executive Director, Alice, has a long time, dog savvy friend who lives near this couple and Cheryl graciously agreed to do the home visit. Cheryl’s report was that she’d like to be adopted by this family. 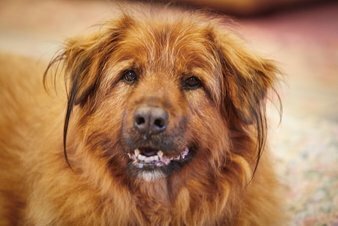 Juanita/Emily no sooner was released from veterinary care when her “furever”family drove down from Sparks to bring her home to meet her new siblings, Max and Bear, two senior Golden Retrievers. 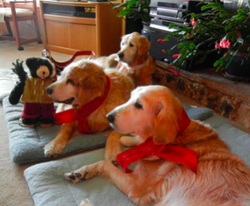 We received a wonderful Christmas photo of all three pups relaxing in the family room. Needless to say, this Special Delivery girl from Lily's Legacy has been embraced with open, loving arms and paws! 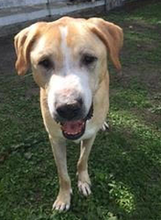 This sweet 10-year-old Shepherd-mix was surrendered in very poor condition. She was flea-infested and nearly hairless. Once she was released to the Sanctuary, she quickly captured everybody's heart with her endearing nature and the best ears-ever! Our love-bug was also very vocal and joyously greeted each person who entered the Bunkhouse. She even welcomed her frequent medicated baths. We're pretty sure she knew they were a part of why she was feeling so much better. The sores healed and a full, glossy black coat soon emerged. Just about every volunteer could be found trying to figure out a way that they could be the lucky one to adopt Ava! 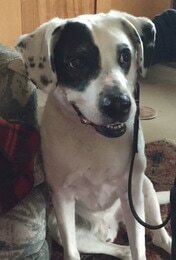 However, because her personality jumped off the Facebook page (we think it was those ears, again! ), the perfect family soon arrived to promptly fall in love with our dear girl. 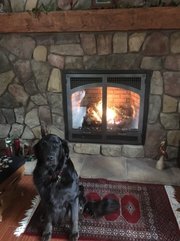 While we certainly missed her delightful presence in the Bunkhouse, we are overjoyed that she is basking in the glow of the love of her new family, frolicking with the pack on hikes and even contentedly lounging beside the family pool in the warmer weather. 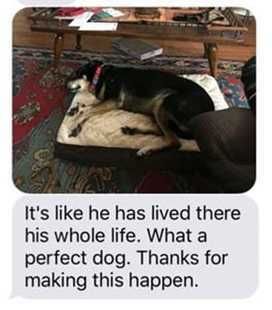 Our beautiful Buddy, an 8-yr.old Lab/Aussie/Hound-mix barely got time to try out his bed at the Sanctuary before he was being whisked away to his furever-home by this wonderful couple. 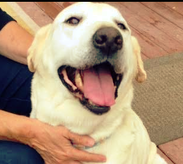 What makes this even more special, is they had adopted Lacy, our Yellow-Lab two-months ago! A recent visit confirmed this was another Match made by Lily! treat. She lounges with loving companionship. Obviously, I adore her and we're perfect together as senior buddies. The process of adopting Tasha was what she deserved. I was carefully scrutinized: filled out a pertinent information questionnaire regarding my home and surroundings; had a delightful home visit by Alice Mayn. I was carefully instructed as to her exercise needs, nutrition, and how to accustom her to her new home. She had been lovingly cared for as one of their "bunkhouse pups" by many great volunteers I met while visiting her prior to taking her home. 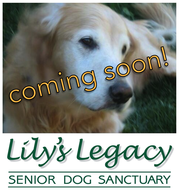 I wholeheartedly encourage anyone looking for a right-match companion to visit Lily's Legacy Senior Dog Sanctuary." Chelsy and Leah were both adopted by the same wonderful family and are having a blast with their new mom and dad! Sweet Lacy received the best Christmas present ever, her forever family! 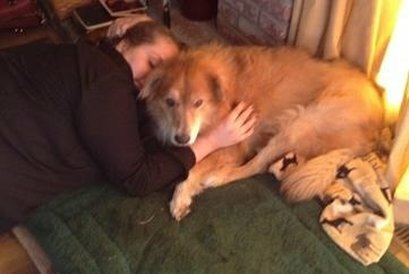 Her new family recently lost their two senior pups and once they saw Lacy, knew the best way to honor them was to give their hearts to her. We are so thankful for the wonderful life they will provide for Lacy. Our deepest gratitude to her wonderful foster Mom who gave her a warm, nurturing environment in which she thrived! Team Lily couldn’t be happier! Cruz came back to us after his last adopter sadly passed away, and was quickly adopted again by two of our volunteers. Although they initially wanted to adopt him last year, they were not able to adopt because their apartment did not allow pets. Luckily, they were moving to a new house this summer and jumped at the chance to bring Cruz home. Cruz gets tons of exercise and play time every day, and when he goes to work with Dad, he gets to go to the beach too! Happy, healthy, and adored! Lucky dog, indeed! 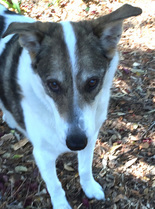 Chloe was adopted at the Bay Area Pet Fair this October 2015. Her new mom and dad say she had settled in very well, gets along with their dog and cat and is just a love bug of a girl. 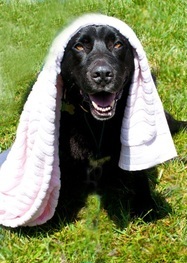 This cute boy, 8 year old Khyber, is having a short stay at Lily's. 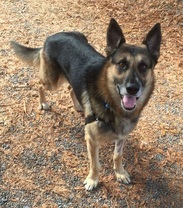 He came in a week ago Sunday and a wonderful lady looking for a male shepherd arrived a few minutes later to meet him. 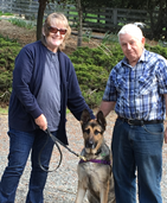 A half an hour later, Khyber had a new home, a new human mom and sweet shepherd sister. What could be better! He has remained at Lily's to have his vet checkup taken care of and because his new mom had a short trip planned. She's on her way back and on Wednesday off he goes to his "furever" home. A great house to live in, a safely fenced acre of land to roam and all the cuddling and TLC he could ever hope for. What a lucky boy!!! Our sweet Willow went to the same home as Smokey! We knew she had a crush on him when they were at the sanctuary, and now they will spend the rest of their days happily romping together. Now living with a brother (Dudley), this girl is happy and healthy. She never looked back on what her life had been. Each day is a happy experience for lucky Starlight! Our little man has left the building! 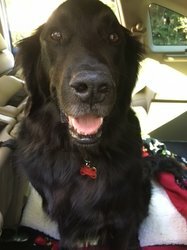 He got into the car of our wonderful foster mom Priss, and never looked back. He will be an only dog household with a stay at home mom. A bonus is two grandkids that visit regularly and will shower him with love. 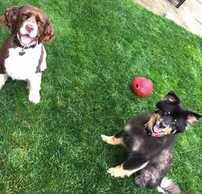 Adopted by a wonderful woman in Petaluma, Ruby and her now brother Boo have a big yard in which to play. She is healthy and so happy, and we are so happy for her! It takes a team and WHAT A HAPPY ENDING! Cute Tiffany came to Lily's just under 2 weeks ago from a deplorable situation - no TLC or human attention and living alone in an outside pen. Fast forward - she has been spayed, had her teeth cleaned and some rotten ones removed and had an ugly growth removed from her front paw. She has healed really well and today, off she went to her new forever home which includes part time living just outside the bay area and part time on a ranch on the south coast. This little girl will finally be loved and cared for as she so deserves with constant human companionship. Picture includes sweet Tiffany, and left to right - Linda our Lily's volunteer who fielded Jo's calls about Tiffany and made sure our intake ball got rolling; Jo, who rescued her - bless you Jo for a great rescue job; Bridget who came to find Tiffany as a companion for her grandmother - thank you Bridget for all your effort to get Tiffany and your grandmother together; and Alice, our director and nighttime nanny at Lily's.